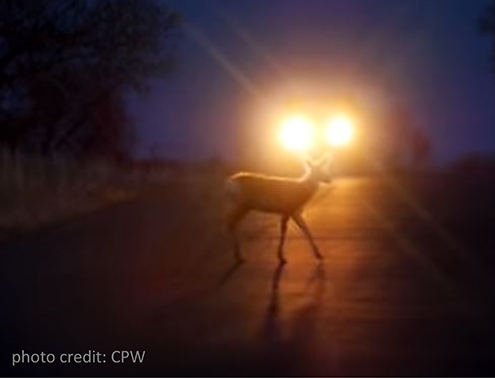 Highway underpasses and overpasses built for wildlife are significantly reducing the number of wildlife-vehicle collisions on roadways throughout Colorado. Recent work in southwest Colorado is helping to make even more roads safer in this corner of the state. Photographs taken with a remote camera at a new underpass on U.S. Highway 160 between Durango and Bayfield show that the passageway is being used by deer, coyotes, raccoons and other small animals. It was completed in the fall of 2016 by the Colorado Department of Transportation. Colorado Parks and Wildlife provided guidance on the project; and now the two agencies are cooperating on a study to identify key wildlife crossing spots throughout the state. "These structures help protect Colorado's wildlife and Colorado's drivers," said Patt Dorsey, southwest regional manager for Colorado Parks and Wildlife. "We're pleased to work cooperatively with CDOT on these projects. Highways pass through wildlife habitat throughout the state and it's only natural that our agencies work together." On Colorado Highway 9 near Kremmling in northwest Colorado, an overpass and underpasses have cut wildlife-vehicle collisions by nearly 90 percent over the last two years. Insurance companies estimate that damage to vehicles from wildlife collisions averages about $4,000 per incident. Mark Lawler, a CDOT biologist, said that research done throughout the world shows clearly that underpasses and overpasses dramatically lead to a decline in collisions. CDOT statistics show that from 2006 to 2016 there were 472 vehicle-wildlife collisions - the majority with mule deer - on U.S. 160 in the area between Durango and Bayfield. But that only accounts for accidents that were reported. Lawler explained that research shows vehicle-wildlife collisions are underreported. "At the new underpass we're seeing a large number of mule deer going through the structure daily," Lawler said. "Animals are using the structure; we're not just moving the problem." There are no statistics regarding collisions available yet for the area near the new underpass. But Lawler explained that an underpass built three years ago between Ridgway and Montrose has cut wildlife-vehicle collisions in that area by approximately 70 percent. Research conducted by the Southern Ute Indian Tribe's Wildlife Resource Management Division, details the patterns for deer and elk migration across U.S. 160 since 2004. Most of the Southern Ute reservation is located south of that highway. Radio collars have been placed on nearly 150 animals and their movements monitored, primarily during migration periods in the spring and fall. The studies show that deer and elk crossings are heavily concentrated in several areas along the corridor between Bayfield and the Piedra River. Lawler said that while deer use the new underpass without hesitation, elk are not using it yet. Elk, however, do readily use overpasses. Hoping to aid elk crossings, CDOT, CPW and the Southern Ute Tribe are working cooperatively to determine if both an overpass and underpass could be built near the intersection of U.S. 160 and Colorado Highway 151 just east of Chimney Rock National Monument. The research by the Southern Ute Tribe shows that are is the location for major elk and deer migration corridors. "The tribe knows the importance of sharing this information with neighboring agencies," said Aran Johnson, wildlife biologist for the Southern Utes. An overpass and related structures there would probably cost about $1.2 million; but funding for the project has not been approved. Lawler said there is no timeline for the work; but discussions have started to explore partnership funding for the project with CPW, the Southern Ute Indian Tribe, Great Outdoors Colorado and CDOT. Aside from underpasses and overpasses, during the past decade in all areas of the state CDOT has put up high fences along hundreds of miles of major highways and has built "escape ramps" that allow animals to move out from the middle of roadways and divided highways. Those projects have also been effective for reducing collisions, Lawler said. The statewide project to identify major crossing areas should be completed in about a year, Lawler said. That study will also look at possible sources of consistent funding for wildlife projects. 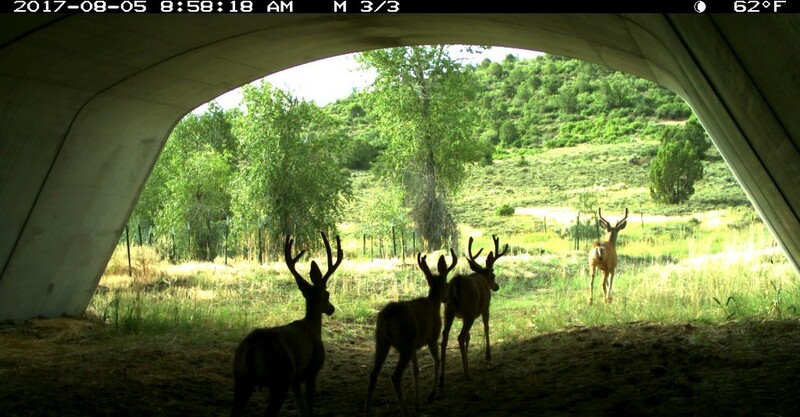 Photos: Mule deer are using highway underpasses throughout the state. 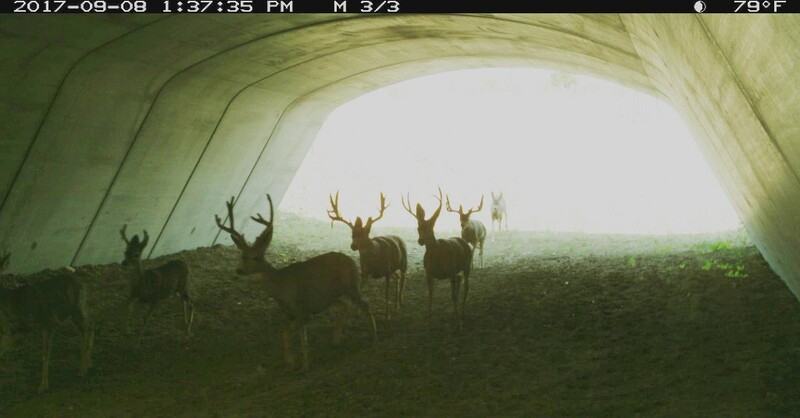 This photo was taken by a game camera at an underpass on U.S. Highway 160 between Durango and Bayfield in southwest Colorado. Courtesy CPW.